If you are planning to purchase a literacy program for instruction, get as much information as you can about a program's benefits and effectiveness. This article provides basic comparative information about a range of commercially available literacy programs. The most recent National Assessment of Educational Progress (NAEP) report indicates that, as a whole, students in 4th, 8th, and 12th grades are not demonstrating marked growth in reading, with scores for disadvantaged students registering lower than in previous years (National Center for Education Statistics, 2017). Though research tells us that most students are fully capable of learning to be competent readers, regardless of their background (Lyon, 2002; Shaywitz, 2003), many teachers in the field have not been offered training in effective, developmental literacy instruction. Many literacy programs have been developed with the goal of closing the literacy achievement gap, and there are currently hundreds of programs being implemented in schools across the nation. While many of these programs arm teachers with effective instructional materials, it is very important to remember that students learn through effective teaching, not through programs. Therefore, it is incumbent upon classroom teachers and school administrators to be able to discern the strengths and weaknesses of the plethora of literacy programs that are currently being marketed. While there is not a specific program that will meet the developmental literacy needs of every child in a classroom, educators who are knowledgeable and picky will find that most programs offer some materials that may prove effective for one or more of their students. 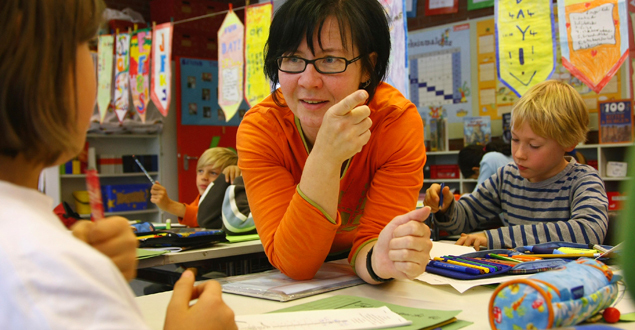 To instruct literacy in a way that enables all students to succeed, teachers need to have access to the research on literacy programs and use that knowledge to guide their selection of programs (or program components), strategies, and pedagogical approaches (McCardle & Chhabra, 2004; Stanovich & Stanovich, 2003). What are my students’ specific needs in reading, writing, vocabulary, and word knowledge? What do their literacy assessments tell me in terms of their strengths and weaknesses and how can I use these materials to meet my students’ needs and enhance their strengths? There is no such thing as a “magic bullet” program. There is no program in existence that will fully meet the literacy needs of every student in a given classroom. However, many programs offer components that, when matched with students’ needs, can be combined and implemented in ways that will result in reading growth. Effective reading instruction includes targeted teaching of phonemic awareness and/or phonics (depending on the students’ needs and grade level), fluency, vocabulary, and reading comprehension strategies (Lyon et al., 2001; Torgesen, 2002). Below, you’ll find a list of thirty current literacy programs that are in use in classrooms around the nation, along with the evaluation of their inclusion of these instructional components. The programs listed here have been reviewed by the What Works Clearinghouse as well as research centers such as Florida Center for Reading Research and the Best Evidence Encyclopedia. Each program listed was found to be “somewhat effective” to “very effective” (Slavin, Lake, Cheung, Chambers, & Davis, 2010; WWC, 2017). Programs that were denoted as ineffective are not included in the chart. Slavin et al. (2010) included a list of over 100 literacy programs that are currently available for purchase, but that do not have any accompanying studies that review the effectiveness of the program materials. Those programs are also not listed below. Notes about the evaluation chart: It is important to note that “comprehension strategies” refers to the inclusion of instructional materials that encourage metacognition and the incorporation of strategies such as prediction-making, visualizing, inferencing, and questioning. Additionally, the chart depicts the specific literacy components that are highlighted and discussed on each individual program’s website. Courtneay Kelly has worked as an elementary school teacher, a literacy specialist, a reading intervention specialist, and an education professor. She received a B.A in English Literature and a PreK-6 teaching licensure from Mary Washington, an M.Ed in Reading Education from the University of Virginia, and an Ed.D. in Curriculum & Instruction from the University of Virginia. She is an active researcher and is passionate about bridging the gap between current research and classroom practices. Currently, she is an assistant professor in the education program at Longwood University and enjoys consulting with local school districts and educators on effective literacy instruction. Lyon, G. (2002). Reading development, reading difficulties, and reading instruction: Educational and public health issues. Journal of School Psychology, 40, 3-6. Lyon, G., Fletcher, J., Shaywitz, S., Shaywitz, B., Torgesen, J., Wood, F., Shulte, A., & Olson, R. (2001). Rethinking learning disabilities. In C.E. Finn, R.A.J. Rotherham, & C.R. Hokanson (Eds. ), Rethinking special education for a new century (pp. 259-287), Washington, DC: Thomas B. Fordham Foundation & Progressive Policy Institute. McCardle, P, & Chhabra, V. (2004). The voice of evidence in reading research. Baltimore: Brookes. National Center for Education Statistics. (2017). National assessment of educational progress: The nation’s report card. Washington, DC: U.S. Department of Education. Shaywitz, S. (2003). Overcoming dyslexia. New York: Knopf. Stanovich, P., & Stanovich, K. (2003). Using research and reason in education. Washington, DC: Partnership for Reading. Lyon, G. (2002). Reading development, reading difficulties, and reading instruction: Educational and public health issues. Journal of School Psychology, 40, 3-6. Torgesen, J. (2002). The prevention of reading difficulties. Journal of School Psychology, 40(1), 7-26.